Dist::Zilla::App::Command::dumpphases - Dump a textual representation of each phase's parts. Will report what phases are triggering as they happen. 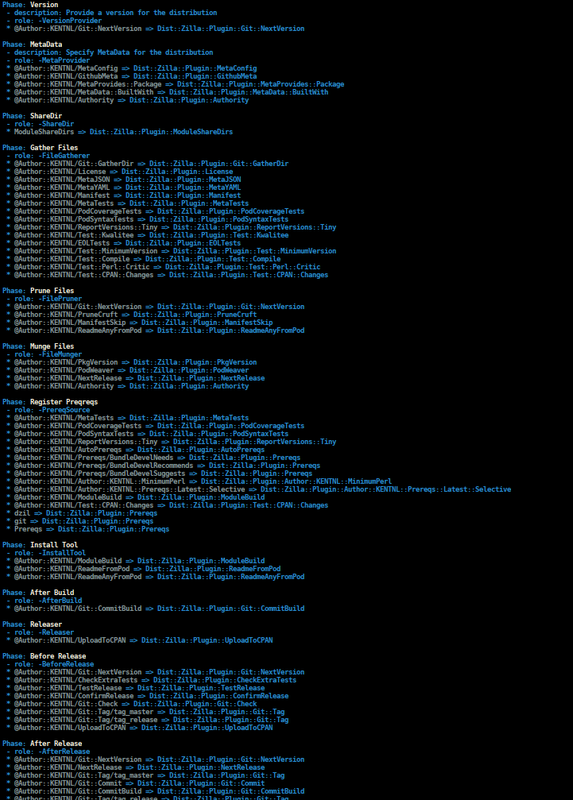 Working out what Plugins will execute in which order during which phase can be a little confusing sometimes. This Command exists primarily to make developing Plugin Bundles and debugging dist.ini a bit easier, especially for newbies who may not fully understand Bundles yet. Technically speaking, this utility deals with more than just "phases", it will in fact dump all plugins used, and it will in the process of doing so, dump things that are part of the clearly defined "phases" that occur within Dist::Zilla. However, if you want to be pedantic, and understand how Dist::Zilla works, then you must understand, many of the things this module calls "phases" are not so much phases. At its core, Dist::Zilla has an array, on which all Plugins are stored. Plugins which exist to augment other plugins ( For instance, -FileFinder's ). Dist::Zilla itself essentially ignores these, and their consumption is entirely regulated by other plugins. Plugins which hook into a specific and determinate phase of the Dist::Zilla build/test/release cycle. These all provide primary methods, which Dist::Zilla directly calls somewhere in its core code base. There's a third kind of Plugin, which is somewhere between the other two, which I presently lack a name for. Like the Phases, they provide primary methods, which are called by Dist::Zilla directly, and they provide information for infrastructural components of the Dist::Zilla development process. However, they're not strictly "phases", because exactly when they will be called ( or if they will be called at all ) is heavily dependent on usage. For instance, -VersionProvider, which is dependent on a few variables, and is called only when its needed, the first time its needed. Which means it could occur as early as creating META.json or it could occur as late as just before it writes the distribution out to disk. This App::Command command will indeed list all of the above, but for the sake of ease of use, the "Third kind" is informally under the umbrella of a "phase". The name of a color theme to use.